Introduction: Spondyloarthropathy (SpA) comprises a small percentage of low backache (LBA) and presents with inflammatory pain. Sacroiliitis in SpAs forms the basis of diagnosis, and may take 7-8 years to become visible in plain radiographs. In order to achieve significant modification of the course of the disease it is imperative to make an early diagnosis, identify risk factors for aggressive disease and initiate the therapy right at outset. Magnetic resonance imag- ing (MRI) is a promising modality to pick up inflammation and structural damage early in the course of the disease. Objective: To assess the role of MRI and radionuclide bone scan in patients with early SpA of less than 2 years. Methods: Patients with inflammatory LBA, defined according to the Calin criteria and satisfying the European Spondyloarthropathy Study Group (ESSG) criteria for SpA of less than 2 years duration, were included. Controls had mechanical LBA. A detailed clinical assessment and assessment of disease activity and functional impairment was done with validated measures. Radiological assessment included conventional radiograph of the pelvis, radionuclide scan and MRI of sacroiliac joints (SI joints). The sensitivity, specificity and predictive value of each modality in contributing to the diagnosis of SpA were assessed. Results: Assessment of 132 SI joints in 33 patients (Age 31 ± 6.14 years, M:F 24:9) and 33 controls (Age 31.8 ± 7.21 years, M:F 27:5) was done. The mean disease duration of cases was 10.7 ( ± 6.97) months. Conventional radiograph failed to pick up sacroiliitis in any of the cases. Positive bone scan was present in 27 patients (21 bilateral sacroiliitis, 6 unilateral sacroiliitis). Bone scan had a sensitivity of 81.8% and a specificity of 88%. MRI abnormality was present in 29 patients (50 joints, bilateral in 21 and unilateral in 8) and in none of the controls. This accounted for a sensitivity of 87.9% and a specificity of 100%. The MRI changes included bone marrow oedema (89%), synovial enhancement (55%), subchondral oedema (41%), erosions (51%) and sclerosis (28%). Both inflammatory and structural changes in MRI showed positive correlation with Bath Ankylosing Spondylitis Disease Activity Index (BASDAI) (P = 0.034, 0.02) and erythrocyte sedimentation rate (ESR) (P = 0.02, 0.001). Conclusions: In patients with early SpA of less than 2 years duration, conventional radiographs did not pick up sacroiliitis; however, both the radionuclide scan and MRI were useful. Introduction: Gout is a heterogeneous disorder, characterized by hyperuricaemia and urate crystal-induced arthri- tis. At a serum urate level, more than 6.8 mg/dL, the solubility limit of monosodium urate in the serum is reached and there is an increased risk of gout and renal stones. Aim: To study the clinical pattern of gout in North Kerala and its associations. 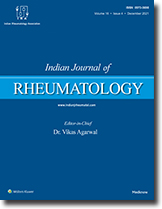 Materials and methods: Patients with clinical and laboratory features suggestive of gout, who attended the Rheumatology Division at Calicut Medical College between December 2006 and March 2009 were included in this study. Informed written consent was obtained from all the patients. Detailed history and clinical examination, includ- ing musculoskeletal examination, was done as per the proforma designed for this study. Results: A total of 83 patients were diagnosed with gout, of which 14 patients were either lost to follow-up or were not willing to participate in this study and were excluded. Sixty-nine patients were included in the final analysis. The male to female ratio was 16:1, with a mean age at onset of 50.7 (΁ 10.72) years. The mean disease duration was 32 (΁ 23.88) months. First, metatarsophalangeal (MTP) joint was the most common joint involved in 91.3% cases. However, ankle joint involvement was the commonest in the initial episode (39%). Overall, 10% patients had polyarticular involvement. Tophi were present in 26%, bursal involvement in 2.8% and 7.2% had normouricemic gout. Mean serum uric acid level was 9.26 (΁ 2.27) mg%. About 40.5% were hypertensive while 46.3% were obese. Sixteen per cent had renal calculi but none had renal failure or nephrocalcinosis. Intercritical period was less than 1 year in most of the patients. Most of the patients were under excretors of uric acid. No patient in the study group had secondary gout. Conclusion: In our study, there was a significant male preponderance. The first attack of gout was in the fifth decade. First, MTP joint involvement occurred in > 90% while ankle joint was commonly involved in the initial attack. High inci- dence of renal calculi was noted. Systemic lupus is a complex disease that poses a lot of management challenges. The introduction of the International Society of Nephrology (ISN)/RPS classification, which has attempted to bring about a more standard- ized approach to reporting of renal biopsy, plays an important role in the management and prognostication in patients with lupus nephritis (LN). The standard of care for severe proliferative LN had been with pulse cyclophos- phamide. There is emerging evidence for use of mycophenolate mofetil (MMF) as an alternative therapy for both induction and maintenance therapy, especially in milder forms of disease. Many biological response modifiers are in the pipeline. Rituximab is the most studied one in the setting of refractory LN with conflicting evidence. Azathioprine remains a cheaper alternative to the more powerful, expensive therapies and has a role in maintenance immuno- suppression. The optimal management of membranous lupus remains controversial till date. Macrophage activation syndrome (MAS) is a rare systemic disorder which results from uncontrolled activation and proliferation of T cells and excessive activation of macrophages. Primary haemophagocytic lymphohistiocytosis (HLH) is recognized as having a genetic basis, but the secondary haemophagocytic syndrome (HS), also referred to as MAS, occurs in a number of autoimmune disorders including systemic onset juvenile idiopathic arthritis, systemic lupus erythematosus (SLE), adult onset Still's disease and other disorders. In this second of the two part series, the clinical features and management are described.